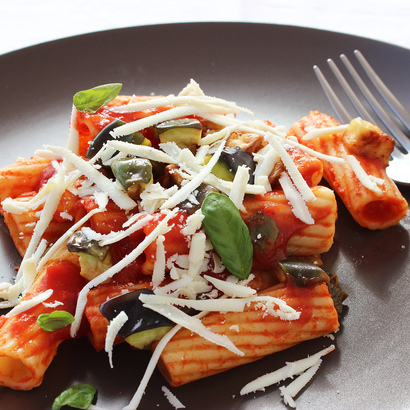 It’s Meatless Monday all over again, and it’s gonna taste so much better with this Italian vegetarian recipe : Pasta alla Norma! Pasta alla Norma is the original name given to this traditional Sicilian dish. According to legend, this pasta recipe was SO good, it deserved to be named as the opera Norma by the great italian compositor Vincenzo Bellini. Tomatoes, eggplant, basil and Pecorino cheese ( but Parmesan makes a great substitute) are the few simple and easy-to-find ingredients you need to make the Norma. It’s a super easy and satisfying meal, perfect for busy week days or to please a large and hungry crowd. The original recipe calls for fried eggplant, but you can make a healthy version and grill the veggie instead of deep-frying. You can also use fresh tomatoes (Piccadilly or cherry are best) instead of canned, for a quick and refreshing version. Bring a large pot of lightly salted water to a boil. Add rigatoni pasta, and cook until al dente. Meanwhile, heat a sauce-pan with 2 tbsp of oil and garlic. When the garlic is golden remove it, reduce the heat and add the chopped tomatoes, a couple of basil leaves and some chili flakes. Let it cook for about 10 minutes then season. While the sauce and pasta are cooking, heat the veg oil on a deep sauce pan over medium heat. Deep fry the eggplant cubes until golden. Drain the cubes on kitchen paper and add them into the tomato sauce. When the pasta is ready, drain and mix with the tomato and eggplant sauce. Drizzle with olive oil and serve with fresh basil and grated ricotta or Parmesan on top. I hope you will give this classic pasta a try! Don’t forget to leave a comment below or on my Facebook page, and let me know how you liked it! Even better, snap a picture, tag it #thepetitecook and share it on Instagram! I can’t wait to see all your delicious creations :). Thank you, hope you try it!! Super yummy isn’t it 🙂 ?